ADPC by the Provincial Department of Planning. Prey Veng is a south-eastern province that borders Svay Rieng in the East, Kampong Cham in the North, Kandal and Phnom Penh in the West and Viet Nam in the South. It is about 90 km from Phnom Penh along National Route 1 and 11. The province consists of 12 districts, 116 communes and 1,138 villages, with a total land area of 4,883 km2. As with other provinces in Cambodia, the climate of Prey Veng is divided into two seasons: the dry and rainy seasons. The rainy season generally starts in May and ends in October followed by dry season from November to April. The monsoon between March and November follows the same pattern as Phnom Penh. 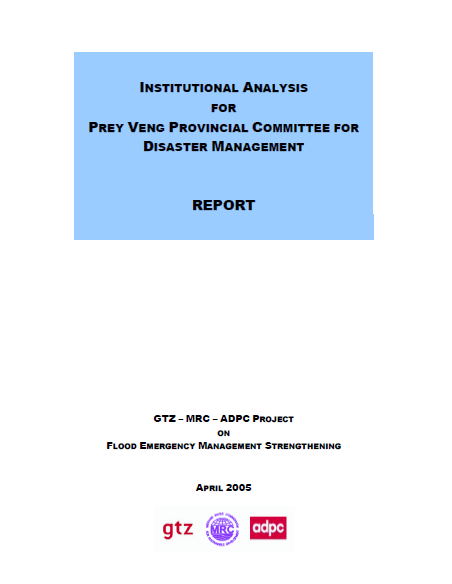 Prey Veng is a low lying province, causing it to be highly vulnerable to floods. Almost the entire land area of two districts, Peam Ro and Peam Chor, is located along Mekong river (56Km) and often suffers from seasonal flood. The districts along the small river, Tonle Touch (196Km), (Peam Ro, Kampong Leav, Pea Reang, Sithor Kandal, Peam Chor, Preah Sdach, Ba Phnum, and Kampong Trabaek) also have 50% of its territories under floods. Drought often occurs in 30-50% of the area in Me Sang and Preah Sdach districts, as well as some others. The total population of Prey Veng is 1,037,575 consisting of 218,989 families. The number of females is 539,641, which is 52% of the population. On average the family size is 4.91 which is smaller than national census figuring at 5.2 per family. The population density in Prey Veng (2002 commune database) is 212 per km2 that is 3 times higher than the national population density (64 per km2- National census in 1998). There are 39,111 woman-headed households, which are account for 17.86 percent of the total families. The total number of vulnerable people is 13,650 invalids, which is equal to 1 person per every 13 families. The main income-generating activity in the province is rice farming. In each district between 80-95% of the population base their income on rice production. Other income-generating activities include subsidiary crops, vegetable cultivation, fishing, animal raising, sugar palm production, local businesses and handicrafts. The province’s dependence on rice farming makes it highly susceptible to weather variations such as floods and droughts.